The aim at Ozone Kites was to create the ultimate light wind performance kite for all terrain. Powerful, fast and consistently forward flying, the Chrono is a light wind freeride boosting machine that also excels in racing on the water, land or snow. A new Chrono 9m has been added to the range because of the high demand from riders all over the world looking for the ultimate mid level wind race machine. 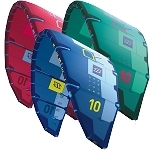 Especially hydro-foil and formula board riders will love the additional size to cover higher winds. It’s incredibly fast and has amazing low and high end performance. For Twin Tip riders it’s the ultimate boosting machine into orbit; you shouldn’t miss out on this size! TECHNOLOGY: The Chrono is at the pinnacle of technical foil design and is Ozone’s first production kite designed with their new re-modeled CAD software; the results are impressive. Using their extensive knowledge in wing development and drawing on a history in aerodynamics they created a no expense spared cutting edge foil kite. Design – The Chronos lightweight double surface design is combined with a high-aspect ratio of 7.0 and an incredible 47 cells, resulting in extreme flight efficiency. The aspect ratio has been calculated to be an optimum match with the profile for maximum performance. A high number of cells mean the ribs are positioned close together, creating ultra smooth surfaces with less drag and maintaining a clean profile. L.E Profile Reinforcements – The Leading Edge is reinforced with flexible lightweight plastic battens to maintain the shape of the profile during angle of attack changes and turbulent airflow. Internal Straps – Newly calculated internal span-wise straps distribute load across the sail evenly and effectively, while also maintaining a cohesive internal balance controlling the high aspect ratio. High Performance Bridle Lines – To keep parasitic drag to a minimum Ozone used Edelrid performance line. 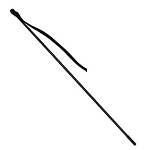 This line is ultra-high quality, non-stretch with a reduced diameter helping achieve a goal of maximum performance. High Performance Materials – High-tenacity sail cloth with extremely low porosity values and an overall lightweight enabled us to further stabilize the canopy and maximize fast flight characteristics. FLIGHT CHARACTERISTICS: If you are looking to get the most out of your light wind sessions, the Chrono will peak your experience. With incredible upwind performance, low-end grunt and huge float in jumps it will have you ripping! The Chrono is for experienced riders or riders with previous foil kite experience. It is not difficult to fly but there are techniques required to fly a high aspect ratio foil kite. Riding on snow or land is easy, with plenty of power and handling in light winds to be clocking high speeds and long airtime. On the water with a Twin-tip the Chrono is a light wind monster; loads of power, easy to jump and stable. Due to the abundance of power and efficiency gaining upwind ground is ridiculously easy, in light wind its impressive how high and floaty jumps can be with the Chrono. No question at all, this is a pop and float machine, just edge hard and send it, too easy! If you race - water, land or snow you need to have a serious look at one of these. The Chrono has all the technology you can imagine. The upwind performance is blazing and it can also hold a very deep downwind line. One other noticeable benefit is how much easier it is to tack when riding with a Foil board or Course board. This is thanks to the longer lifting period the Chrono gives you during that critical tacking moment compared to an LEI. RELAUNCH AND SAFETY SYSTEM: The Chrono is a closed cell foil and has great water re-launch, but we recommend that you keep it flying and out of the water if possible! A drainage system on the wing tip allows any water that may have entered the kite to drain out. The Chrono features a simple yet effective front line flag out safety. After releasing to the flag out safety you should check the speed system, bridle lines and your flying lines for twists before restart. KITE ONLY - With technical rucksack, ground stake & repair kit. COMPLETE FREERIDE – Chrono Freeride Control System, technical rucksack, ground stake & repair kit. COMPLETE RACE – Chrono Race Control System, technical rucksack, ground stake & repair kit.